41 years ago this week: Nice "D" Snyder! I don't know if it's the sadness of our first Christmas without the Sonics (sniff-sniff), or maybe all this talk about about our man Bob Blackburn, but it seems everyone is getting nostalgic about the Sonics. Check out the great story at the Tribune about Wilt dropping 52 points and 38 rebounds (!) on the Supes 41 years ago (!!) this week. A sad piece of news to report from the Seattle Times this morning, where Steve Kelley reports that Bob Blackburn, the original Sonic broadcaster, is in the hospital after suffering a head injury in a fall. 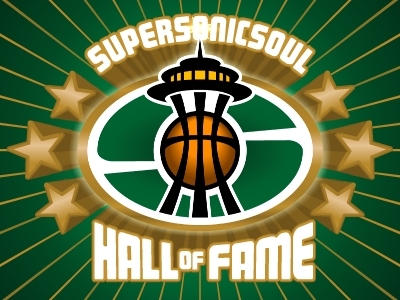 Back in October, we ran our final SuperSonicSoul Hall of Fame article, and it covered the two titans of Sonic broadcasting, Blackburn and Kevin Calabro. In retrospect, I'm glad we were able to put that story up when we did, so that he could know the words came from pure appreciation, and not the inevitable sentimentality you hear when a legend's health is in jeopardy. But I'm even more glad I had the opportunity to listen to Blackburn for more than a decade, that my initial introduction to basketball came from his voice, and that no matter what the future holds for basketball in Seattle, a part of my memory will always contain his descriptions of a Sonic highlight. At this point, I can only offer my best wishes and prayers to Bob and his family, and our hopes that he makes a complete recovery. The greatest moment in Seattle sporting history occurred when the Sonics defeated the Bullets three decades ago. How lucky we are that a wonderful man like Bob Blackburn will live forever as the chronicler of that event. Claymate of Bend It Like Bennett does a nice Ebert-style writeup on the latest episode of The Simpsons, which has an eerily familiar story. Definitely a must-read. I stopped watching new Simpsons episodes years ago. The Montgomery Burns-Clay Bennett parallels never get old though. Now if you'll excuse me, I'm off to shop for a Springfield Excitement game jersey. - when Clay Bennett fired PJ Carlesimo three weeks ago, PJ thanked him. - Oklahoma State has scheduled them for a non-conference game. - Vegas is considering taking them off the books for the remainder of the season. - Ford is thinking of getting out of the naming rights for the arena because they don’t want to be associated with such a miserable product. - that Luke Ridnour likes to watch OKC highlights, just to cheer himself up. - the NBA is contemplating only playing 3 quarters when the Thunder play the Celtics in Boston. - the Clippers/Thunder telecast Tuesday night came with a “May Not Be Suitable for Young Children” warning. - Aubrey McClendon is actually glad to be at the office, just because it means he’s not watching them play. - the team is starting to count broadcasters, trainers, and delivery men as part of the night’s attendance. - Nick Collison asked Robert Swift if he could teach him how to injure himself. - that when his wife asked what he wanted for Christmas, Scotty Brooks told her a bottle of vodka and a lobotomy. - Clay Bennett’s wife cut his weekly allowance in half. - their last broadcast was pre-empted to show Barry Switzer’s colonoscopy, and the ratings went up. "Just because the access now, there's so much media availability and everything else. There's just so many bloggers; everybody's got an opinion." -Kevin McHale, explaining to Don Seeholzer of the Pioneer Press why coaches and GMs are falling so quickly this season. 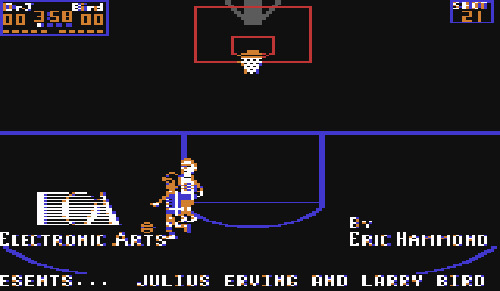 Personally, I blame Tom Ziller for Reggie Theus getting canned. If he would have just been more positive at his site, I'm sure Reggie's family wouldn't have had to burn his fur coats for heat this Christmas. Have no NBA team at all? It's not so easy, is it? Bear in mind that the last time Oklahoma City won a home game, the stock market was at 9600 and Sarah Palin was in the running to be Vice President of the United States. Yes, it's been that bad for the good people of Oklahoma. Begging the question, again, is miserable NBA basketball better than no basketball at all? When I started talking about NBA attendance a month ago, I received some criticism for how I presented the information. Specifically, the critics pointed out that I was using partial results for 2008-09 and comparing them to complete results from last year. You know what? The critics were right. It was unfair to use returns from a partially completed season and expect that to be an accurate reflection of how the season would unfold. All you have to do is look at how the 76ers attendance jumped dramatically in the second half of last season to know that early results are not necessarily predictive. What would be better, then, is to compare how teams have done on a game-by-game basis from last year to this year. That would be much more illustrative of how franchises are faring. To sum the whole bag of numbers into one tidy sum, it looks promising for the league, as the overall attendance numbers through nine games has improved by 22,350 over last season. But even a first-grader can see that things aren’t as rosy as all that. Consider that two teams, New Orleans and Oklahoma City, are responsible for 54% of the league’s growth, are both coming off of seasons that would have been nearly impossible not to improve upon. A similar number of the league’s decline (i.e., 54% of the league’s negative performers), would require four teams, indicating that while the positive reports are narrowly focused, the negative ones are much more widely spread. Consider also that there are nine teams with improved attendance figures, but 15 teams with worse attendance. Again, this points to a small, deep pool of improved teams and wide, shallow pool of negative ones. When David Stern was interviewed by Bill Simmons last week at ESPN, the commissioner denied Simmons’ inference that the league’s numbers may be a bit off this year, contending that, to paraphrase, they were doing just as well this year as last, and that last year was their best year ever. Well, he was either lying or being disingenuous. Half of the teams in the NBA are showing a decline in attendance from last season. The Spurs sold out on opening night, and have see a decline from the previous year in nearly every game since. The Rockets, a team many expected big things from with their off-season moves, are off more than 7,000 from last year’s attendance. The Grizzlies, a team no one could call fiscally healthy entering the season, have done worse than last season in every game but one this year, and have drawn between 50-60% capacity eight times for every one time they exceed 90%. I’ll go into the data more as the week progresses. As always, feel free to counter the data with your interpretations. I will say, though, that there are positives to take away from the numbers. The Blazers, Hawks, Sixers, and Pacers have all posted significant improvements, which is admirable considering the economic malaise afflicting North America. More importantly, looking at the data this way will enable us to more accurately see just where the NBA ship is heading, and will eliminate some of the speculation. Bill Simmons' most recent podcast on ESPN contains an interview with Seattle's favorite commissioner, David Stern, and while Stern danced around questions with the grace of Fred Astaire, he did provide listeners with some interesting pieces of information. None greater than his response to Simmons' query about the sad state of affairs surrounding the Sonics' departure and relocation to Oklahoma City. "Everyone agreed," Stern stated, "that a new arena was necessary. Exactly how it would be funded became the issue, and that issue became contentious." Of course, by "everyone," he means everyone affiliated with an NBA franchise. And by "the issue," he means the issue the NBA wanted to focus upon. Lord knows, David Stern didn't think a new arena was necessary less than 10 years ago, or else he wouldn't have commented to a Seattle reporter that KeyArena was one of the best arenas in the league. Funny how time changes one's perspective. But that falls short of the most revealing part of the conversation. Early in the podcast, Stern rebuked Simmons for the host's statement that a handful of teams might be in financial trouble, claiming that the NBA's group of owners are sufficiently wealthy enough to withstand any economic "downturn." "This economy is going to contain certain disruptions, and out of those disruptions may come opportunities for some cities, and Seattle may be one of them." Sadly, Simmons failed to point out Stern's hypocritical statements, although he did his best to get the commissioner to admit that what happened to the Sonics was beyond sad. Obviously, Stern knows as well as anyone how perilous the situation is in cities such as Memphis, and that big, fat carrot called "relocation" is being dangled in front of Seattle's politicians. What remains to be seen, though, is if any of them are interested in biting. I've just finished a book about the Congo (In the Footsteps of Mr. Kurtz; worth checking out, although not as good as King Leopold's Ghost), and, among other topics, it covers the disparity between the wealthy friends of Mobutu and the rest of the country at the time of Mobutu's fall from grace. (Well, not grace exactly, perhaps fall from power is more apt ). Essentially, the country had a few folks living the high life, and the rest struggling to find ways to keep from starving to death. Which takes me in a convulted fashion to the Western Conference of the NBA this year. At the moment, there are nine teams with 10+ wins, all winning close to 60% of their games. And then there is the rest of the conference. Of the six remaining teams, not one of them is winning more than 30% of its games. It's hard to appreciate the disparity when the teams have only played a quarter of the season, but imagine if you extrapolated the current records to a full 82 games. The worst of the 'haves', Phoenix, would finish with 47 wins. The best of the 'have nots', Golden State/Memphis, would finish with 23. In other words, the nine teams competing for a playoff berth would have a two-month cushion over the next six teams. It's an amazing disparity of success, isn't it? Perhaps someone with more diligence than I should comb through the records to see if, as the Zaireans did for so many years, the elite of the Western Conference are fattening themselves off of the backs of the poor. At the moment, Chesapeake is winning, clocking in at a cool $14 after shooting up about $3 today. Meanwhile, the Thunder trudge along with the grand total of two wins. At this pace, the Thunder would finish the year at 8-74, but we all know that with the naming of Scotty Brooks as Head Coach, they're sure to go on fire and start winning games at a record-setting pace. I'm putting them down for at least 10. Last Tuesday (Nov. 25), I ran a piece about the NBA’s television ratings, wherein I questioned the merits of the previously linked Nielsen story which raved about improved NBA ratings. My quibble was in regard to the way in which the data was presented. Rather than list all the teams’ ratings, it only listed the top ten, a completely flawed methodology. As I argued last week, how can you say the league’s ratings are improved when you only tell us half of the story? Well, consider this the other half of the story. Thanks to an anonymous commenter with access to local Nielsen ratings, here is the whole enchilada. Listed are the teams, and the percentage change in their ratings relative to last season. Note that these ratings are only for local broadcasts, and do not include ESPN, TNT, ABC, or whomever. Let’s assume Oklahoma City’s ratings are better than the Sonics’ (for the sake of Clay Bennett’s mental health, they better be). And, let’s assume the Raptors and Jazz are also doing decently. I think we can also assume that the Hornets and Kings are seeing lower numbers than before, simply because that’s what their attendance figures would indicate. Regardless of the missing numbers, that’s a pretty whopping indictment of how popular the league is. The argument that attendance is down but ratings are up? Hogwash. There are four teams with an increase of 20 points or more, but there are nine with decreases of 20 points or more (if you include the missing five teams, the numbers might change to five increases and ten or eleven decreases). The Boston Celtics – World Champs, etc, etc, - have seen an 18% decline in their ratings. The Mavericks are looking at a drop of nearly half from last season. Now, there are rebuttals to this argument. For one thing, the season is still early and the NBA will obviously do better after the NFL and college football are in the rear-view mirror. Plus, the really meaningful games (and concurrent improved ratings) don’t occur until the spring. Still, I think it’s safe to say that anyone who argues that the NBA is sailing along just fine, thank you, is burying his head in the sand. Let’s face it, folks, if your best argument is that you’re more popular than the NHL, well, that’s not much of an argument. You know the hackneyed expression, "Oh, no he didn't!" I think that applies here. Oklahoma City, I'm not hatin' on you, honestly. But, man, when you're using stock footage of a group of four people ambling to your arena to show how hyped your city is for the NBA, and when your singer has to read the lyrics from his cell phone, well, maybe you just ought to go back to the drawing board on that one. War "Not in Our House." Here’s an unusual question for you – what sort of relationship, if any, exists between NBA attendance and the US economy? The reflexive answer would be a strong one. Naturally, when the economy struggles, people cut back on entertainment expenses, such as season tickets, luxury suites, Danny Fortson jerseys, you know, big-ticket items. For the Econ majors out there – I hear you. GDP is a crass measurement of economic activity. It fails to account for any number of items in day-to-day life and has been habitually adjusted by the government to hide deficiencies in economic progress. I get it. But, all that being said, it is the common measuring stick for the economy in the US, so let’s use it anyways. Shown below is the data from 1963-2008. As you can see, there is more than just a passing relationship between the two sets of numbers but, when viewed from this distance, it’s somewhat tenuous. However, as time has marched on, you can see that : 1) the two numbers have developed a stronger relationship, and, 2) that the NBA is much less prone to year-over-year swings in attendance growth now than in the past. For example, from 1963 to 1993, there were seven instances of a yearly change in attendance greater than 10%. From 1994 to 2008, there were zero instances of that happening. What caused the decline in wild swings? 1. The league has grown more popular. Up until the late 1970s, the league was such a marginal entity the NBA Finals were shown on tape delay. Since the days of Magic and Bird (and MJ), that’s no longer the case. The league has reached a somewhat consistent level of popularity, and is unlikely to repeat its huge increases (and decreases) in attendance. 2. Stadiums are much closer to capacity now, limiting the ability of the league to experience large levels of growth. Any increases now would be marginal, short of selling seats on top of the backboards or staging a “Winter Classic” at the Rose Bowl. But back to the point of this story – what can we learn from previous GDP downturns? Do they have an effect on the NBA’s attendance? More than the relationship between the league and GDP, these charts show us that the league has essentially stagnated since 1997. In the decade since the strike which wiped out the 1999 season, the league has registered either negative or marginally better attendance figures every season. As an illustration of this, from 1980 until 1999 the NBA posted a yearly attendance increase of more than 2% no fewer than twelve times. Do you know how many times they have matched that number since then? Which goes back to my point that the league is at a standstill. As I see it, there are two possibilities for the current set-up: Continued stagnation or decline. With the recession in full swing, it seems much more likely to me that – at least for the time being – decline is the more likely option. For those who wonder why the NBA is working so hard internationally to “grow the game” (and, yes, I, too, despise that phrase), perhaps this sheds some light. Perhaps the NBA has realized that any future growth for their sport will have to come outside the US borders, and that the American populace just doesn’t have any room in its belly for more sports. Sure, it might not win many games, but it would a helluva lot of fun to watch. In fact, a very good 1980s movie could be made on just that premise (starring, of course, Chuck Norris as the coach). Heck, do you think any NBA team would want to go into battle against a this group of guys, knowing full well they've got nothing to lose? 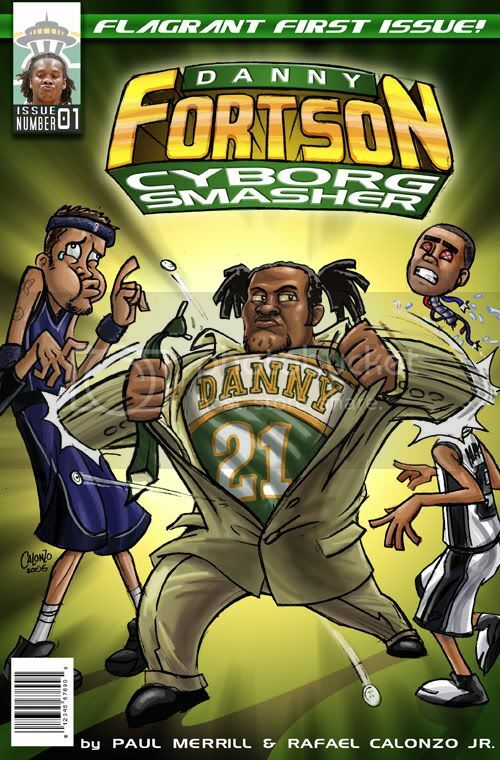 After all, the only thing scarier than Danny Fortson on a 3-year contract is Danny Fortson on a 3-week contract. Free chalupas to everyone if the Sonics get more than 5 technicals! Given the state of affairs in NBA attendance this year, I thought we should take a quick look at how the league fared over the course of the four-day holiday weekend. Thanksgiving means turkey, mashed potatoes, and basketball – at least to NBA fans, anyways. While it could be argued that Christmas Day is the start of the NBA season, the NFL is winding down, you get a couple of marquee games to watch, Thanksgiving is also a good time to gauge the temperature of the league. So, how did the NBA do this past weekend? First, the raw numbers. That narrows the gap a bit, but even a crusty old grump such as myself would have to admit that the league is at least doing as well this year as last. Again, the nod goes to this year. This is an admittedly small sample size (29 games in total), and doesn’t take into account who was playing, weather, etc. But, for a quick sampling of tastes from last year to this year, it gives us some insight anyways. For once, let me say, a pat on the back to the league for keeping its head above-water in difficult times.